Why does no one in Thailand recycle, Bangkok is a polluted mess, yet everyone uses CFLs? 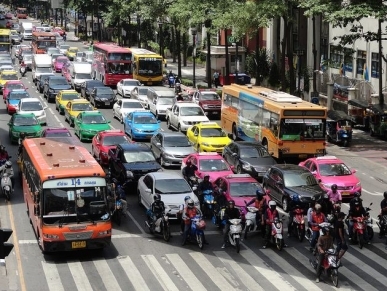 Few Thais recycle, no one bikes, plastic bags are everywhere and Bangkok is afflicted by gridlock and pollution. So you might say that, in general, Thais behave more like citizens of a rapidly emerging economy than the typical Brooklyn environmentalist. Why, then, does virtually every home use efficient compact fluorescent lights (CFLs). Americans and Europeans needed a ban on incandescent bulbs to make the switch. Not so the Thais, where you can still buy cheaper, more inefficient incandescent bulbs at the corner store. Was it the influence of a higher authority? Thais famously revere their 85-year-old King, the world’s longest-reigning head of state, who happens to be an environmentalist. The answer is, mostly, no. Continue reading at EDF Voices. This entry was posted in International. Bookmark the permalink. Post a comment or leave a trackback: Trackback URL.